Even though last year's Winning Eleven 6 was a brilliant simulation that set new standards in soccer sims, Konami apparently wasn't satisfied and has produced an even deeper and more polished title with this year's impressive installment. Winning Eleven 7 has all the features players have come to expect and includes more than 100 teams, 21 stadiums and thousands of real players. The game features several modes including single match, League Mode, Cup and, Master League. In league mode, you compete against other clubs in a full-season, while Cup mode is an international tournament with other countries. Winning Eleven 7 also includes an extensive Training mode, which has two types of practice. In Free Range Training, you can practice your moves in a real soccer mode, while in Challenge Training, you can refine your moves and strategies in a variety of mini-games. What's cool about these modes is that you're able to earn WE Points, which you can then use in the shop to unlock items such as extra players, team uniforms, and more. These modes are all smartly designed, allowing newbies to learn the basics and experts to tune their skills. Once you hit the field, you'll find that the intuitive and smooth controls from last year's game have been tweaked to allow for even more precise control of the action. Switching players and defending your territory is essential in order to succeed in the game. When you're on offense, the changes in passing and shooting are especially noticeable, making it much easier to keep the ball moving towards the goal. Winning Eleven 7's passing system has been made much easier, making it easier to throw the ball, but the enemy AI is more sophisticated, making interceptions more commonplace. When you are defending, you'll find more moves as well, including new tackles, an improved goalie rush move and the ability to apply pressure to the opposing team with just the press of a button. Throw-ins and goal-shots are easy to perform, but require good timing and pressure in order to succeed consistently. Winning Eleven 7 makes more progress in basic team formations, with more sophisticated control that allows for on the fly adjustments. Using this can help keep opposing teams off-balance. The gameplay is incredibly smooth and lifelike, with each match unfolding quickly. As in real soccer, the final scores are usually decided by a single point, but each goal is definitely earned, making for an intense game. Before each match, you can set a variety of parameters that can affect gameplay including weather, field, and formations. In addition, you can set a variety of strategies for the team such as adjusting the balance between attack/defense, which side you want to attack, counterattack scoring strategies, placing your attackers on the left or right side of the field and more. Players can also set their team's aggressiveness, and can adjust the disposition of each individual player to name a few options. This makes for an incredibly deep simulation that allows you to have control over all-aspects of your team. Once you get on the field, you'll find that Winning Eleven's strategic elements have been deepened, especially when playing in the Master League mode, where substitutions and player changes are more critical than ever. However, the gameplay feels even smoother this time around, which gives you slightly more leeway. The standard modes offer plenty of fun and challenge, and as stated, there are now stakes in the training and single match modes, since you can earn points there. However, significant changes have been made to the Master League mode, which is now deeper and more authentic than ever. This mode allows you to take complete control of a team throughout a season or even multiple seasons if you wish. Each season starts with basic league matches, to playoff rounds and finally to the championship cup. You earn points for each victory, but can only continue as long as your team points stay above negative. As before, you can edit each player's attributes, names, and skills between matches and can also change team colors and uniforms if you want. Each team starts off with a standard roster of players, but you can create your own and use them on your team. You can also draft and trade players from other teams, using the Negotiations, where you can sign players using Transfers, Drafts, Free Transfers, Straight Trades, Loans or signing players to long-term contracts. Once you have acquired a player for your roster, you can then add them to your team lineup immediately, or can train them for a period to increase their skills. While it might seem daunting to find players from such a vast selection, Winning Eleven 7 makes the task of finding just the right abilities much easier thanks to its new search engine, which allows you to find players with particular strengths much easier. The interface for the Master League mode is streamlined, making it simpler to navigate menus and run the team. The deep and challenging Master League mode is an excellent addition to the series, and adds a nice fantasy element to the game. One of the most remarkable improvements this time lies in the visuals. There are several new arenas, and the appearances still look stunningly realistic with excellent light sourcing and shadows used to create realistic playing environments. Winning Eleven's player models have also undergone dramatic improvement. The player models come alive with new moves and animations which makes each character look, move and react just like their real-world counterpart. Each player's movements look amazingly lifelike with new moves sets for each, which gives them a more varied appearance. In addition to this, the game allows you to select from several different camera angles with close-in TV style approaches to broad views of the field. 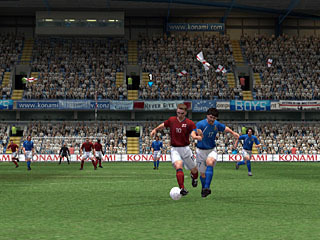 The game's production polish is especially evident in the dramatic cut-scenes after goals, where you can see the players' facial expressions and dances, which look nearly photo-realistic. Winning Eleven 7 also sports intense crowd noise to punctuate the action and excellent play-by-play commentary in both English and Spanish that creates an authentic and exciting atmosphere. From an aesthetic standpoint, Winning Eleven 7 represents a new high-water mark for sports games and soccer in particular. 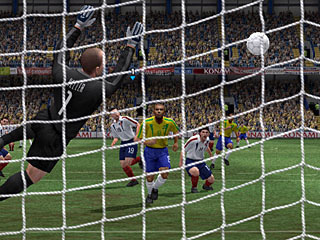 The game's highly polished visuals make it the best-looking and most realistic PS2 soccer title to date. Unfortunately, WE7 lacks many of the team and league licenses, so you won't be able to play as Manchester or AC Milan. Instead, there are generic teams and rosters, with many famous players absent. This is the only major area where WE7 falls behind FIFA, but polished gameplay more than makes up for it. Even though soccer has unfairly received a bad reputation as a 'boring' sport, playing through Winning Eleven 7 garners you a new appreciation for the sport's nuances and subtleties. WE7's fluid controls and fast give the player a remarkable degree of control over the action. Getting the hang of all the ins and outs of the gameplay will take awhile for newbies, but Winning Eleven 7's excellent play shines once you've mastered the basics. It's not the easiest sports title on the market, and players looking for a superficial arcade game are probably going to be frustrated. However, those in the know should appreciate the game's attention to detail, evident in its fluid graphics, slick presentation, and intuitive controls. The Master League mode is the icing on the cake, with an almost unprecedented amount of depth and challenge. While last year's title was top-notch, this year's installment is even better. Winning Eleven 7 is the by far, the deepest and most authentic soccer title on the PS2 and comes highly recommended for sports fans.